I have signed the petition myself earlier. I would like to see Mr Tan Kin Lian run for office. In the petition, there is a section asking "EP, MP or both". EP is Elected President and MP is Member of Parliament i.e. Mr Tan Kin Lian himself is probably unsure which path he should take and is asking for your opinion. For now, at the very least. Probably easier to secure votes as all adult citizens are eligible to vote regardless of which constituency they belong to. But then again, Elected President no power one. Voted in liao, then what? Yah lah. They say Elected President will have access to the books to the national reserves as it is the job of the Elected President to safeguard the reserves for the the people. We saw how that turned out with the last last one right? Even if 1 against 83 in parliament, his voice would be more heard and taken more seriously. But then not many single candidate ward left for him to contest. Maybe even less if the Gahmen were to anyhowly draw the GRC lines again in the next election. Some say to take over Potong Pasir from Mr Chiam See Tong as the latter is due to retire. Perhaps? And he were to gamble big and take on a GRC then if successful, he can one-shot bring in 5 or 6 people into parliament. If his own candidacy is strong enough, then he too can bring in other candidates via the "back door" as this GRC system has been exploited in the past. Perhaps a taste of their own medicine? So anyway, as I have mentioned earlier, even if we do get the 100,000 signatures, it doesn't mean he will get 100,000 votes if he were to run for Parliament. The voter in this case has to be eligible i.e. of adult age, is a Singapore citizen and has not been struck off the electoral register for one reason or another. By then, would there be enough votes to win? Personally, I would prefer for him to run as a Member Of Parliament but only as a non-partisan independent. Personally, none of the opposition parties have earned enough credibility for me to entrust the entire country to them and besides, I think Mr Tan Kin Lian would be able to operate better as standing as an opposition candidate may unnecessarily antagonise the PAP. Don't get me wrong, I still want the PAP to retain power but not to the current extreme extent of 82 vs 2. Perhaps 60 vs 24? All I want is a good enough size of the opposition and independents to properly check and balance the Gahmen and not let the PAP yaya papaya, sukah sukah anyhowly pass this law, change that law without properly debating it out. Even fielding new candidates will also need to be careful, or else the incompetent ones will confirm kena hantam jialat jialat by these checks and balances. On the same token, the opposition and independent candidates will also need minimum standard of quality or the hantam will also go their way. At the end of the day, both sides ensure each other weed out the idiots. Can you not see the upside to this? "Given a choice between a MIA incumbent and an active newbie. I'd sure as hell would like to give the latter a try. It can't be worse that what we already have right? So what do we have to lose?" So anyway, I put "both EP & MP" when I signed the petition, for I think I should leave that choice for Mr Tan Kin Lian to decide. Here's what you can do, if you are interested. Click Here if you want to download the form where you will then collect 20 signatures offline before scanning and emailing it back to epsingapore1@gmail.com. Click Here if you want to volunteer to help out in getting the signatures. 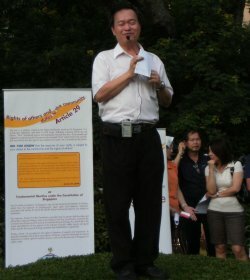 Click Here if you want to sign the petition to encourage Mr Tan Kin Lian to run for public office. Tell everyone about this as I expect the mainstream media to be choked off. Not a bad idea. I am skeptic if Singaporeans really want this. On one hand Singaporeans want change but on the other they are not willing to give it a try. Most talk only but when it comes to actual voting they chicken out. KungFuFish: Well, I am hoping to see change but not as drastic as PAP losing majority power. All I want is a bigger opposition/independent voice in parliament. That's all. Yes I agree too. I also want PAP to continue their work. Hopefully something will change to give the opposition a louder voice. People must dare t take that first step. Not easy. KungFu Fish: Exactly my point. How often do we get some one willing to step up to serve? And so have we have a Mr Tan Kin Lian who is willing to do just that. So all the more reason to give him a shot right? What do we have to lose? What are the chances PAP ropes him in soon?? ahTiong73: I think chances is zero since Mr Tan has made it clear that he does not want to be part of the PAP and besides, PAP had him for 30 years and did not put him up to run, why should they do it now?